Have you met an alchemist in real life? Do you know how they look like? No, the long white beard is not obligatory. In fact, a pretty, dextеrous lady can do the alchemist magic as well. Today, in A Portrait of The Artist, I would like you to meet Myra, the creator of HerbanLuxe who, armed with much knowledge and experience, has been making natural herbal makeup since she remembers herself. In 2007, she appeared on the Oprah Winfrey Show as a finalist in her search for the next big idea. In 2009 she sold her business and in 2011 we find her on Etsy, catering to earth-friendly shoppers who appreciate handmade. 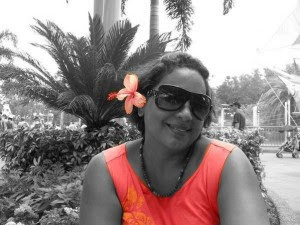 Before I proceed with the interview, I will share a secret with you - I tried Myra's products! Yes! 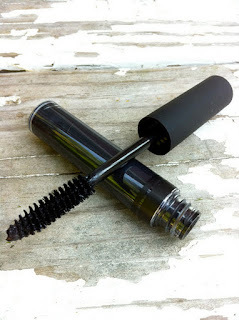 She sent me a surprise pack with eco-friendly makeup where among other things she had put the best mascara I have ever tried, a lipstick that not only smelled delicious but also made my lips soft and sweet and blush - exactly the color for my complexion. How she could determine the colors is still a mystery to me. But, ah well, what else can you expect from an alchemist woman! Going through your etsy profile we understand that you got your passion and knowledge from your grandmother in Puerto Rico. In a strange way, this reminds me of Gabriel García Márquez's One Hundred Years of Solitude and the strong women of the Buendía family. What qualities are needed to be able to turn herbs into makeup? Patience and a basic understanding of herbs. I remember being mesmerized as I watched my grandmother, pick, chop, mix, blend, sift, blend again and pour. I didn’t start learning how to create makeup right off the bat. I learned how to use and interpret tarot cards and how to make medicinal teas and oils that my grandmother used for “santiguos” (a ritual where prayer and oils were used to cleanse the body) and “limpiezas” (a clearing or cleaning which is performed in a house or oneself to remove bad karma). However, my grandmother loved getting all dolled up so, my first makeup product was a lip potion. My grandmother explained the purpose of the ingredients we were using. For example, whole rosebuds are used to attract love and passion, olive oil is used to cleanse the soul, glycerin and castor oil are carriers. Every herb you use has a meaning and the intent of the person using the herbs also affects the final product. You can say, it’s a bit of herb magic. 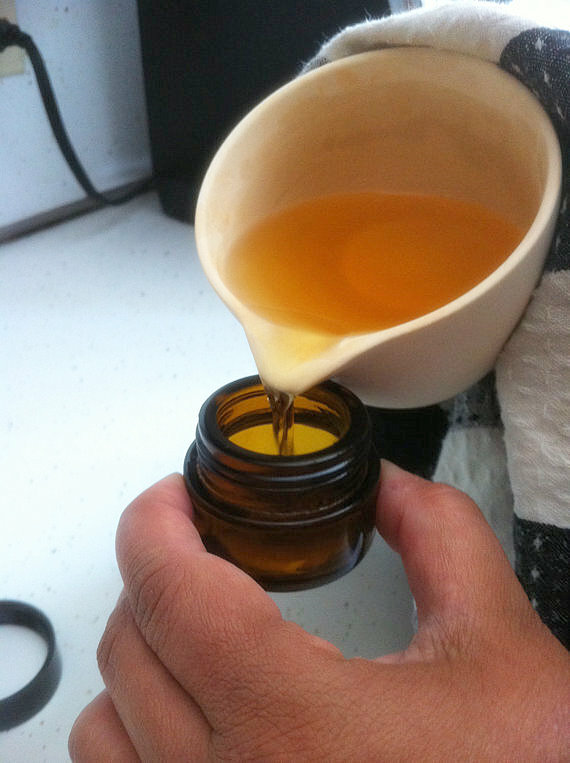 Making natural herbal cosmetics is pretty much like alchemy. Do you sometimes feel like an alchemist? Ha, there’s an on-going joke in my family that I’m more like a “mad scientist” than a makeup developer. So yes, I feel like an alchemist every single time I begin creating products, especially new products. Why? Well, because just like an alchemist, I have to understand the ingredients I’m working with. I need to know their properties, what their boiling points are. I have to to understand the interaction I can expect between ingredients, any negative combinations that may exists and the effects they may have on the skin. I tend to perform a bit of Reiki just to boost my products, which just adds to the esoteric nature of it all. You make everything by hand, how long does it take you to produce a batch of eye shadow for example? Do you actually make them in batches? And where do the colors come from? Different products take a different amount of time to make. I do create items in batches, but I make only enough to fill the orders I have received within a given week. So for example, I spend a weekend creating all my bases. I create a base for my three types of foundation: loose powder, mousse, & liquid (I offer by request only), I create a base for my eyeshadows and for my lip potions. Then I work on color, mixing my iron oxides to create the shades I offer in my shop. 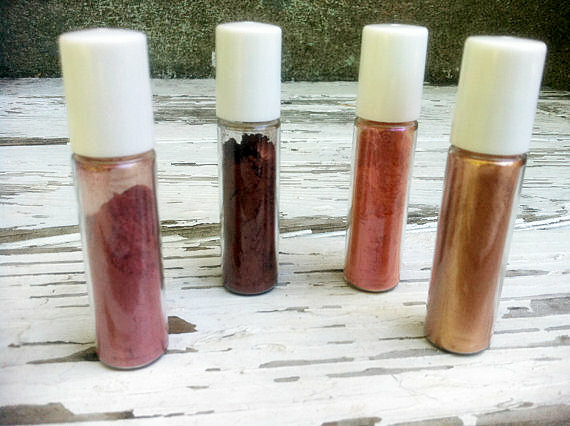 My colors are a mix of mica and powder pigments which result in deep colors; I mix these in advance and store in dispensing tubes as well. This gives me the ability to create just one eye shadow or multiples at a time. Once an order is placed, I mix the base and the color, add my antiox mix, package, label and ship. Mixing the bases and colors ahead of time cuts down on the amount of work I do when an order is received. I do replace everything within 3 months if not used. I keep a serious log as I tend to forget and I write dates on my dispensing jars as well. I have 4 suppliers for all the ingredients I use. For large batch ingredients I use a supplier in NJ who I have been doing business with for over 10 years. I also use a local supplier here in Connecticut for my organic ingredients. Creating eco-friendly beauty products is as green as it can be. How do you put to action your views on sustainable living and ecology in your everyday life? I grew up in an environment where things like solar panels, collecting rain water, eating food grown in the yard and water and electricity conservation weren’t something you talked about, it was just a part of every day life. I grew up with my grandparents and my mom, my grandmother would cook in a fogon (outside wood stove kitchen hut thingy), she would use the indoor kitchen to boil water. We had solar panels that heated our water. We had drums that collected rain water. We had basic necessities, there was no excess. Today, I am very far from living the life I lived as a kid. Technology and the hustle & bustle of daily life have skewed my life. However, I make it a point to recycle, lights are not turned on in my house until it’s dark out and all my light bulbs are CFL. I have a day job so I commute by train to work everyday. I am conscious of my environment and the things I bring into my home. It’s the small things that count, but if my grandfather were alive and saw my living conditions, I’m sure he would change my world around. What is the greatest challenge in hand-making natural cosmetics? My biggest challenge is making sure I can recreate a product over and over again, resulting in the same shade. Adding an extra pinch of let’s say red iron oxide to a foundation recipe I’m following will result in a totally different color than expected. So I have to make sure I’m not distracted. This is the main reason I create one product at a time and I don’t try to work on multiple products at the same time. I have to share that this is the only time in my life that I’m not multi-tasking. When I get into my zone, my family knows not to disturb me. I have three girls, ages 22, 19 & 12 and my Juan and Only (inside joke). When I’m mixing they will ask if they can watch, when it comes time to package and label they are allowed to help as long as they do the job right. Otherwise, they need to go do something else. I take pride in my finished products, so my girls know the rules. How did appearing at the Oprah Winfrey Show change your professional path and what led you to etsy? I get this question a lot. My appearing on Oprah gave me the ability to check off an item on my bucket list. You know... Go zip-lining, Check; jump out a plane, Check; appear on Oprah, Check. I mean it was a surreal experience. Did it change my professional path? No. Did it change my life? No. However, I learned some hard lessons. I also learned to roll with the punches and I learned that when opportunities appear, you have to be prepared. My company grew faster than I could, so I did what I would assume others would do - I sold. But, I didn’t want to stop creating makeup. It’s a form of stress relief for me, I can zone out and just create. I had joined Etsy when it first started and I never really did anything with it, except watch and make a few purchases. Then in 2009, I decided to test the waters. It wasn’t until after I sold my company that I decided maybe Etsy is the way I could keep creating and getting my new makeup formulas out there. I like to take my creative side one day at a time and live for today. What happens, happens. I have a good client based both on Etsy and outside of Etsy. I’ll be honest and say that I don’t know where I’ll be creatively in 5 years. I mean my current business could grow exponentially and I may end up selling again or I may end up quitting my day job to run my company fill time. So for now, I’ll just sit and enjoy the ride. Right now, I’m digging Earnest Efforts, Spirit Shakers. I sit at my thrown and shake my spirit shaker while thinking up new recipes. I also absolutely love the custom Wonder Woman push pins that BeansnThings made for me. Wonder Woman was my childhood idol, I remember wearing Wonder Woman underoos and using aluminum foil to create my headdress and cuff, then running around yelling, “Wonder Woman!” So everytime I look at the push pins which are on my board, they bring a smile to my face. I looove natural make up! Checking out the shop see to find some new favorites. wonderful interveiw ..success story with flair!! Very interesting interview and I love all natural makeup and face products...so much better for your skin. Off to check out her shop! Wonderful interview! Looks like she has quite a selection of all natural makeup. Very interesting interview! She has a fun job. Very well-done, interesting interview! I have enjoyed reading it. Aww! This is such a lovely interview. 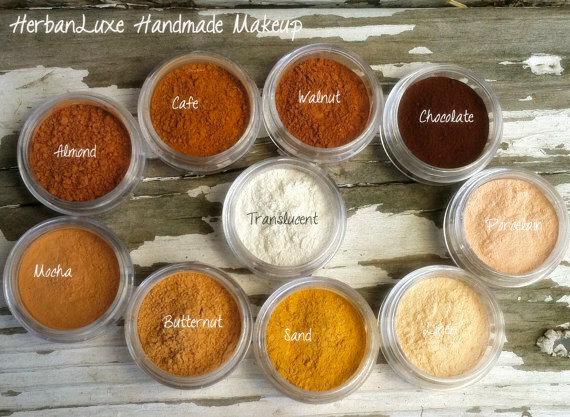 I used to make mineral makeup and body products and I loved it. Her colors look so lovely, too :) Great read!